This post has been a long time coming. Not because I have been lazy, but because when it comes to Eric and recommending baby products I am always extra cautious. Last year whilst scrolling through Instagram I stumbled across Kit & Kin, and, having been utterly enamoured by both the designs on their nappies and company core values I was the kind recipient of a sample pack of their nappies to try (you can read all about my first impressions here). 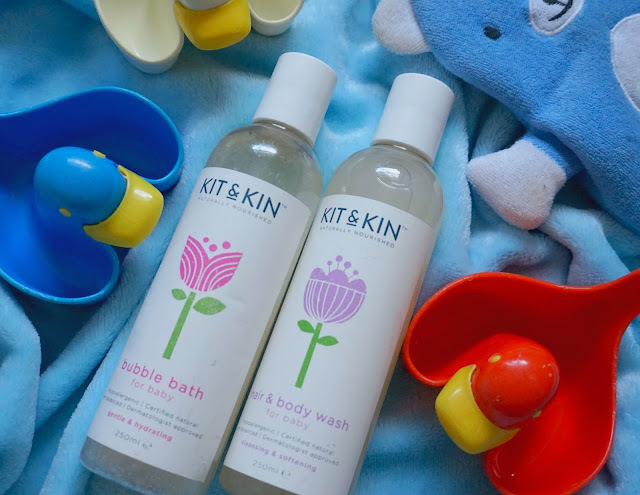 Having been really impressed by my experience using the nappies (they are so easy to put on one handed), Kit & Kin reached out to me and asked if I wanted to receive some baby skincare products to review. A little while later a lovely parcel arrived at my door containing both a full size hair and body wash and a bubble bath. Like with the nappies I really liked the packaging for both the bubble bath and the body wash. I am incredibly careful when it comes to what I use on Eric's skin. It is really sensitive and I take care to choose products that contain good ingredients and aren't overly perfumed. So what I really appreciated about the Kit & Kin packaging was that it wasn't too fussy. With a simplistic design with an easy-to-read choice of font, it highlighted all the important information that you want to know as a parent in a really attractive way. I also liked the fact that each of the products differed slightly in design, with each showcasing a different coloured flower. It sounds like such a small thing but when it's bath time and you have other things to focus on, having something identifiable that allows you to easily differentiate between products is highly appreciated. Because I find bathing Eric a little tricky, we tend to wait until Ryan is home. This also means that E's skin doesn't dry out too much. Baths usually happen a few times a week, and we make sure baby has a good old soak (he loves being in the water). So we waited for a Sunday morning to try out our Kit & Kin goodies. We drew the water to a reasonable depth, tested the temperature (we use a clean temperature probe to get an accurate reading) and then poured in a little of the bubble bath. Certified by the COSMOS association and approved by dermatologists, Kit & Kin's skincare line is also hypoallergenic, meaning that my concerns over using products that were going to irritate Eric were instantly squashed. Both the bubble bath and the hair and body wash have a soft and delicate fragrance too that is the kind of scent that reminds me of babies - fresh, lovely and very comforting. Since he was teeny tiny Eric has suffered with cradle cap. We have tried everything on it from Detinox to coconut oil. Nothing seems to make it go away 100%. It is a bit of a bugbear but something we've learnt to deal with as best we can. Going in to testing out these products I had no expectations of it helping with his flaky scalp. However, the formula is really gentle and nourishing that it means after use his head looks much better and his hair feels super-soft and looks really healthy too. As a company I really rate Kit & Kin. Keeping both baby and the environment in mind they are a brand I would not hesitate to use again. Now that I am a mother I care a lot more about what is in the bath and body products I buy so knowing what I am using is free from harsher ingredients helps put my mind at ease. The bottles were received contain a really generous amount and will last for ages. We are working through one at a time as the bubble bath is gentle enough to use as a baby shampoo too (we use it in foam form). Have you tried out anything from Kit & Kin? Let me know your thoughts in the comments. * Kit & Kin very kindly gifted me the bath and body wash and bubble bath. This does not affect my opinions. They are always 100% honest and informed by my own experiences. For more details please see my disclaimer.